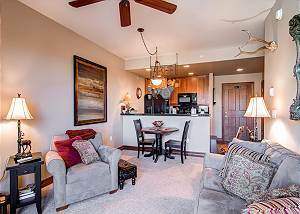 1 BR, 1 BA CONDO – HOTEL AMENITIES – ON GOLF COURSE Located just north of Breckenridge, the Highland Greens Townhomes and Lodge offer luxury, space and one of the best year-round vacation locations in Summit County! In the winter, free private shuttles whisk you to Breckenridge Ski Resort in just minutes, or take advantage of the Gold Run Nordic Center for cross-country skiing, ice skating and sleigh-ride dinners. In the summer, there's the Jack Nicklaus-designed, 27-hole Breckenridge Golf Club, bike paths and hiking trails galore. And the views of the Tenmile Range are fantastic. The Lodge at Highland Greens offers the convenience and comforts of a condominium with hotel amenities including a fitness room and sauna, ski lockers, elevator access, and a friendly lobby/lounge area with a large fireplace for relaxing and socializing. The unit’s kitchen features granite counters and is fully equipped with all appliance, pots and pans. The living area is a cozy retreat after your day’s adventures: Snuggle up next to the gas fireplace and take in a movie (or tomorrow’s snow forecast) on the large LCD-TV. The bedroom features a king bed, another LCD-TV and a private door to the balcony. There’s also room for two more to sleep in the living area, as well as an in-unit washer/dryer. The Lodge at Highland Greens is a great choice for a couple or small family looking for comfort, convenience and a quiet location. Call us today! SLEEPS 4: MAIN LEVEL - Bedroom : king bed, private door to balcony. - Living area: queen sleeper sofa. - Bathroom: tub/shower. SPECIAL UNIT NOTES – PLEASE READ: - No Pets / No Smoking. - A $350 refundable damage deposit will be charged to credit card at check in. - Renters must be a minimum of 25 years old. - Parking: 1 outdoor space total. - No air conditioning. All units include at least one fan.